Hannu's blog: Pentax 645D Digital. Finally. What a pleasant surprise for the photographers having some selection of 645 lens in their shelf. 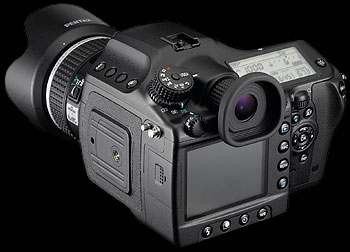 Pentax promises the new 645D will work with the "old" glass like a charm. Rumors about the mid-format digital back from Pentax have been around far more than five years, when Pentax was an independent imaging company with no Hoya (purchased Pentax Imaging at the summer of 2007) and Samsung (helped Pentax to co-develop dslr-s starting the model K10D, the cooperation was announced late 2005) in the horizon. The unit has CCD sensor (44x33mm) by Kodak, approx. 40mpix, 11,5 ftops of dynamic range and sensitivity IOS80-800. Pentax has also included dual slots for SD/HC cards, I guess majority would have been expecting CF-s instead. The estimate price should be $10,000 with the shipping beginning early May in Japan. Mamiya has also announced some new models lately (with the new 56mp model as their flagship) so it will be a nice year for all the mid-format fans.